At Cottonwood Stables, we provide the best care for competition and pleasure horses by providing routine care and a low stress, drama free, fun, comfortable environment for the horses and owners/riders/trainers alike! 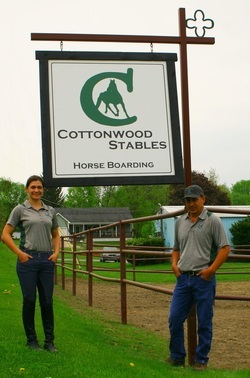 Cottonwood is a 5th generation equine facility and we have over 40 years of combined equine management experience. Our stable is owned and managed by Jeff and Emily Senesac (pictured to the left). Jeff and Emily are both very knowledgeable in caring, riding and training horses.